According to Wikipedia, Google is the most visited website in the world and by far the most popular search engine, which makes it the primary method for people to find information on the Internet. Due to its common use as a verb describing the act of online searching, in 2006 “google” was added to the Oxford English Dictionary. This is not an article on Google rankings and SEO – there are already enough blogs and books on the subject. Hopefully you are already publishing regular, quality content, have a properly built website that includes well written page titles and alt tags. If you are doing this you should be ranking high within Google search results. Despite having a known, easy to remember website URL, many people will simply use Google, typing in your association’s name to your website. Because of this, you need to make sure Google will show the correct information. 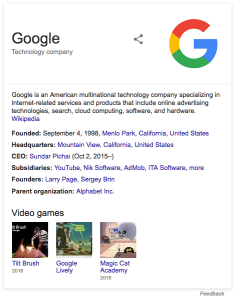 When you conduct a Google search, the top result will have the Google+ profile on the right side of the screen (if you are conducting the search from a desktop computer). The profile will have contact information, photos, hours of operation, etc. Even if you have never created the Google + profile there will be a basic account setup for your association’s website. Google creates this without you having to interact with them at all, by using information directly from your website. Google uses a variety of methods to gather information from your website. Your contact information is used to create the account when building a website, some use this information to fill in the contact information, which can show up on google even if it’s not visible anywhere on your website. You might be lucky and all the information will be correct. Great, you’re done right? No, you can still add photos, hours, and social media profiles manually. People will often see this automated Google+ profile before they see your website, so it is vital to make a good first impression. To make edits you will have to create a Google My Business account. If you see your information is not correct, you need to ‘claim your business’ before you can make the changes. You will need to have a Google account to generate your My Business account. Something to watch out for is that you might be connecting it to your personal account if you are already logged into your google account when you start this process. To some users this may not matter, just be aware. Like a lot of Google’s services this can be a mildly frustrating process, but it can make a big difference on what your visitors see when your website is searched. If you have wrong information, correcting it can be an invaluable change. Even though Google is the number one search engine, it’s not the only one, it can be worth it to try other search engines, such as Bing or Yahoo.